Many months ago, I launched STEEM.CENTER in hopes of solving the knowledge crisis in Steemit, where only the few elite knew everything, and everything was scattered far and wide across thousands of outdated STEEM posts. The reality? Not much has improved. Just over a month ago, @wagnertamanaha decided to create a program where people are paid for their contributions to the WIKI, centralizing our knowledge, keeping it up to date, contributed to by multiple people. What's the difference between STEEM, SBD, SP, and VESTS? And quite a few more, especially if you contribute! 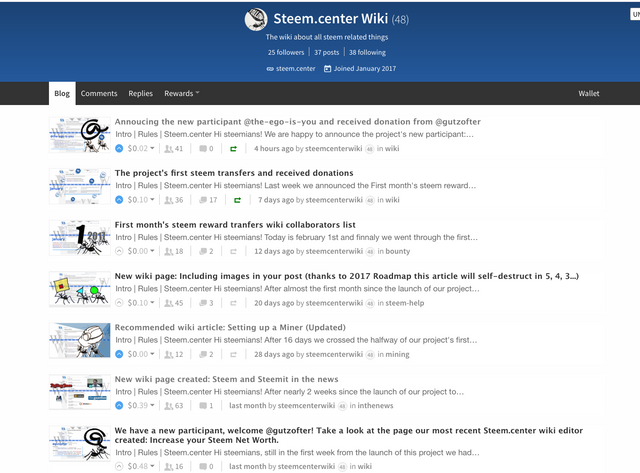 I strongly recommend you check out the posts at https://steemit.com/@steemcenterwiki and join in on contributing where you can. It helps STEEM, and it's guaranteed income for you too. It's nice to see something like this being developed, especially if it is kept current. As a relative newbie here, I have found it confusing to wade through lots of published articles... only to discover that the information offered is now out-of-date. The creation of @steemcenterwiki is thoughtful development. What you said is very true the little information we have about steemit is scattered all over the place. Thanks to you and @wagnertamanaha for this innovative account. Thank you and good luck for us all! Thank you very much and let's make Steem.center in the center of all things steem! Great! How do i know what topic to write about? Who is the contact person? is it @wagnertamanaha ? Thanks for posting this. I had no idea. Anything is welcome :) - anything you personally had issues with, or someone you know had issues with, is a good idea to put on there. @wagnertamanaha might have some ideas. There is a page on the wiki, Articles for Creation which has a few ideas of pages to create. shyness may have its own rewards. Hi! As @someguy123 said you can create a wiki page about anything related to Steem and Steemit. I added more suggestions in the Articles for Creation page, including less technical themes like founders' short bio, Steemians, Steemfest, etc. Why not a wiki article about Steem Gnome adventures? :-) Thanks for your interest and I hope you have fun joining @steemcenterwiki project too! This is a very good idea, in particular for new users to get information from one unique place. It might be worth asking @timcliff if he can add this to the welcome page links. This post has been ranked within the top 10 most undervalued posts in the second half of Feb 13. We estimate that this post is undervalued by $19.87 as compared to a scenario in which every voter had an equal say. See the full rankings and details in The Daily Tribune: Feb 13 - Part II. You can also read about some of our methodology, data analysis and technical details in our initial post. I've added this to the @steemittalk podcast agenda to be discussed on this Saturday's recording! I'm doing this today and signing up at Steem Center. Thanks again. Wow! This is friggin awesome!